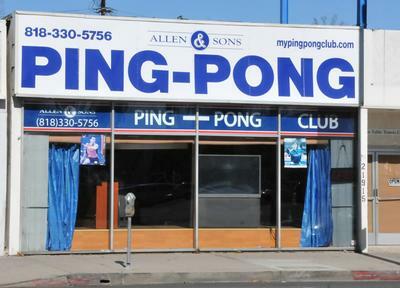 Allen & Sons Table Tennis Club is located in Canoga Park, California, United States. Our address is 21915 Sherman Way, Canoga Park, CA 91303. We are located a half block east of Topanga Canyon, across from Big Lots and there is free parking in the back. Our table tennis club is suitable for everyone, so whether you’re a beginner or a professional, you'll find what you need here. We are open daily from 10AM – 10PM. 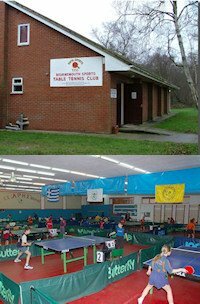 We have 8 Butterfly Centerfold table tennis tables within a 4,000 sq ft, playing area and, if you need them, we have paddles and balls which you can rent. We also have a Newgy table tennis robot which you can use as a great way to practice your game. 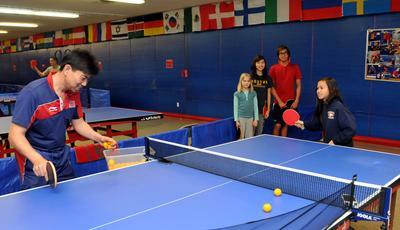 Our table tennis club also has air conditioning, so you can keep cool while you play. Our coaches (Bella Livshin, Dinh Nguyen and Sandeep Mahat) take beginner, intermediate and advanced classes. Seniors (65+) join us Wednesdays at 10AM, coach Bella will teach you how to have fun with this exercise. Seniors take a $4 discount on Monday, Tuesday, Wednesday, Thursday, and Fridays from 10AM to 5PM.